A uniquely Albertan phenomenon was the "Buffalo" grain elevators, built by the Alberta Wheat Pool. These elevators were an attempt to improve upon the wooden grain elevator, which was largely unchanged after decades of use. The intent of the Buffalo elevators was to improve capacity and loading speed, and perhaps to make them cheaper to construct as well. The first version was the Buffalo 1000, known as the "Buffalo slope". The first was built in Magrath, Alberta in 1979. The design was radical in many ways. The bins that hold the grain were not vertical, but were built at a 30 degree slope to still allow the grain to flow "downhill". The bins were built from 42 pre-cast concrete modules. The elevator has five spouts to allow five rail cars to be loaded at once, unlike the traditional elevator which can only load one rail car at a time. The design was innovative but it did not work well in practice. The slope was insufficient for some grains, causing the grain to hang up and require manual intervention to flow the material into the rail cars. I read a comment that the reason was traced back to the temperature that the concrete was poured at; if it wasn't at the right temperature the concrete had a surface roughness that didn't allow the grain to flow. Modern elevators use metal pipes to ensure a smooth delivery path for the grain. 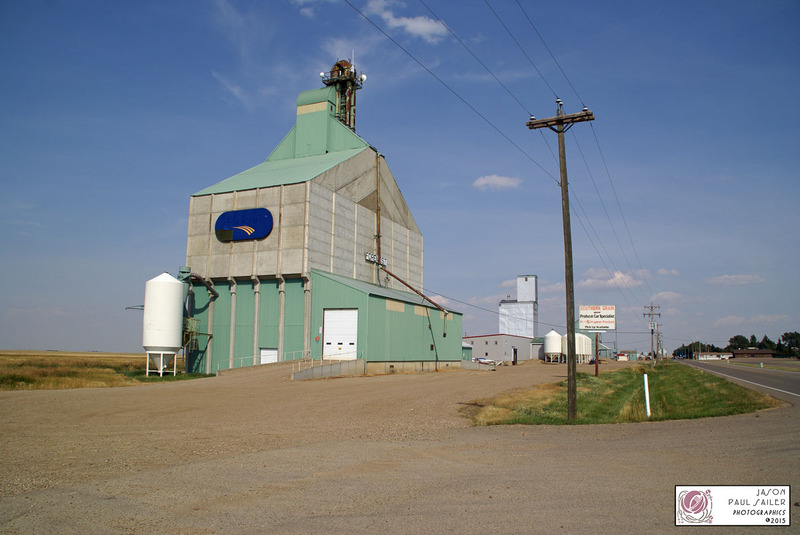 The Magrath elevator was sold to Parrish and Heimbecker in 2000, who closed it in 2003. It was then sold to Ben and Donna Walter Farms and is still in use today. I visited it last fall with Jason Paul Sailer. 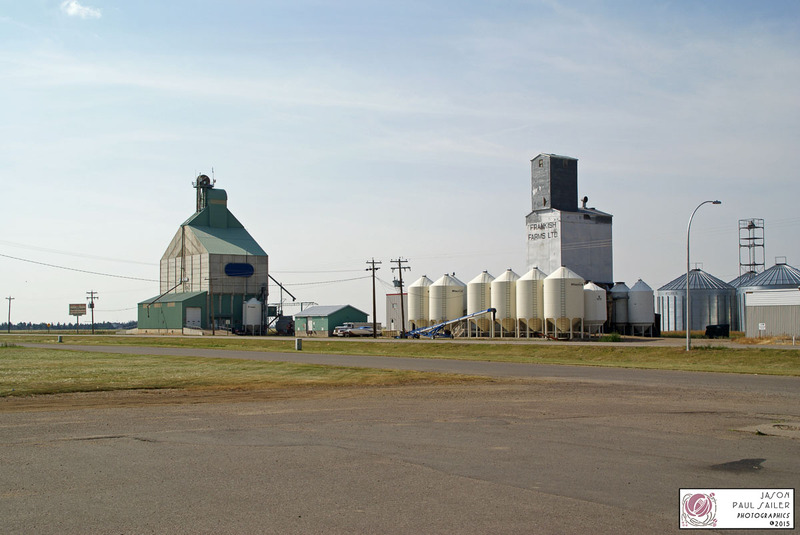 Magrath has several grain elevators but no railway, but it is well worth visiting for the variety of elevators there. 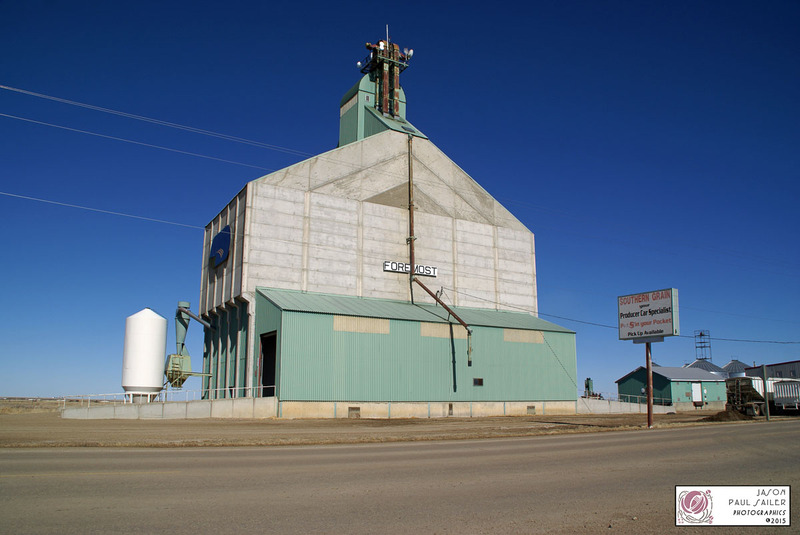 A "Buffalo slope" grain elevator was built in Vegreville, AB in 1981. It was demolished in mid 2010. 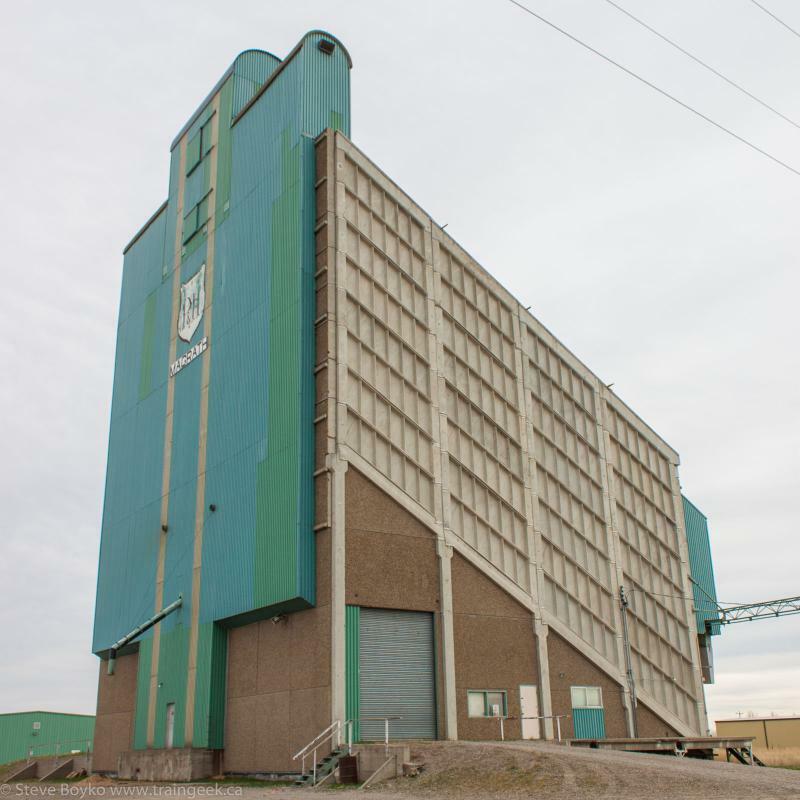 A third "Buffalo slope" / Buffalo 1000 grain elevator was built in Fort Saskatchewan, in 1981. It was closed by Agricore in 2001 and is now owned by Sime Farms. After the "Buffalo slope" elevators, the designers went back and produced a "Buffalo 2000" design. These were more traditional in shape, but still incorporated concrete extensively in their pre-cast bin floors and cast-in-place bin walls. They had a capacity of about 190,000 bushels in 30 bins. 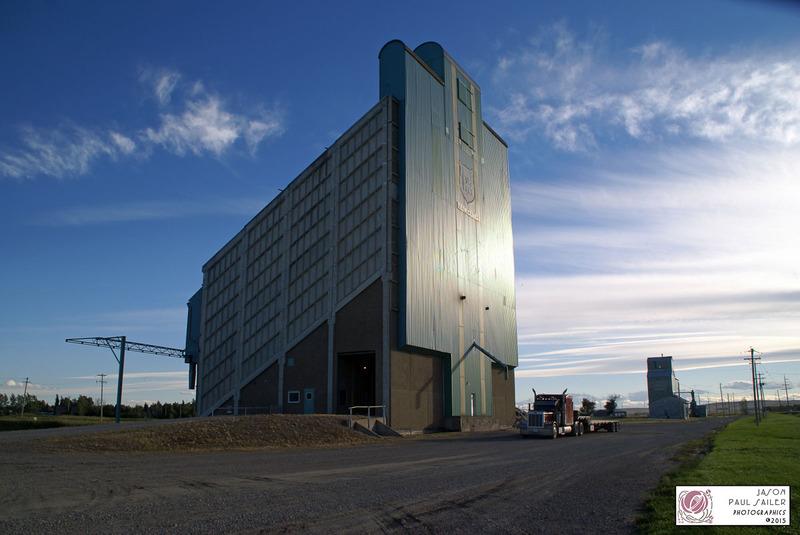 A "Buffalo 2000" grain elevator was built at Lyalta, Alberta in 1982. It appears the Buffalo 2000 elevators only had one rail car loading chute. Another "Buffalo 2000" was built at Foremost, AB in 1983, with a capacity of 185,000 bushels. It was closed in 2002, but was privately acquired and is now operated by the local "Southern Grain Exchange" group (Google Maps). Jason Paul Sailer shared three photos of the elevator, taken in 2014 and 2015. Yes, Brazil! The Buffalo design team came up with the Buffalo 4000 design, featuring bins in a double V pattern. Several were built in Brazil in the 1980s, ranging from 25,000 to 100,000 tonnes in capacity. I believe the facility shown in the Google Street View below in Uberlandia is the 100,000 tonne Buffalo 4000. 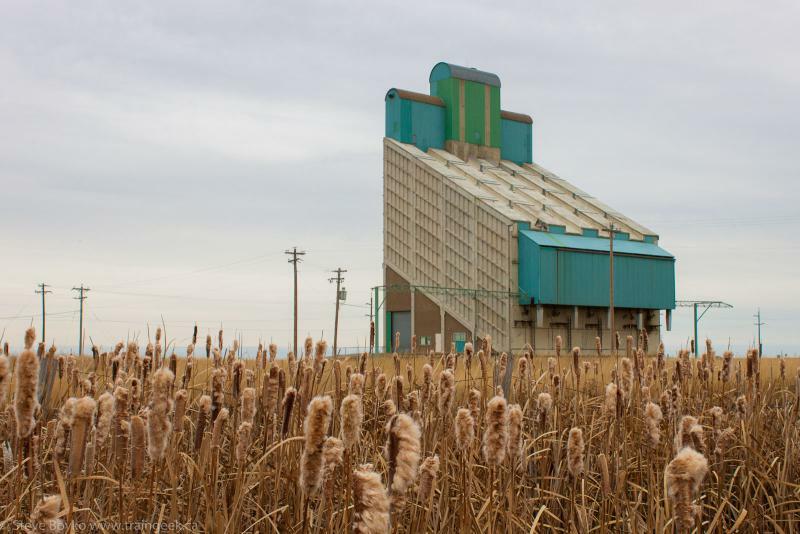 The Buffalo grain elevator was a bold attempt to redesign the grain elevator, but ultimately it was a failure. 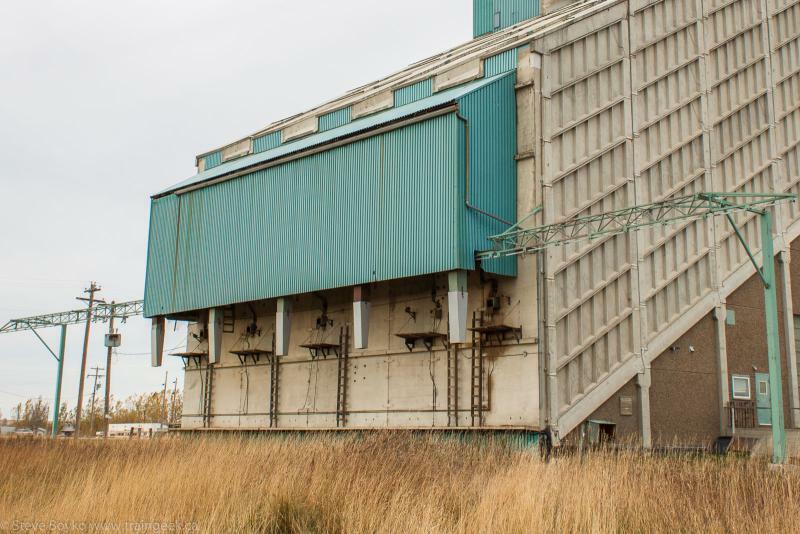 They were too difficult to build, too expensive, and they were overtaken by the slip-form silos of today's "high throughput" (HTP) regional terminal elevators. Great post about a little-covered topic, Steve. Q: What did the mother buffalo say when her little boy buffalo left home? Chris - I know an person who works for the owner of the Magrath Buffalo elevator. Perhaps I should ask for an peak inside? Great article Steve, and thanks for including some photos of mine! Chris - Thanks! I'd love to see you cover a Buffalo elevator interior! Jason - Make that call! And thanks for supplying your photos!